A couple of weeks ago I attended a film festival where several book trailers were played on a movie theater screen. Sitting in the dark, popcorn in hand, surrounded by others in the audience, I realized that the way I felt about the videos on the movie screen was different than how I responded watching them online. Though the content was identical, my experience of the videos was quite different when delivered on different platforms. The fact is that different platforms come with different expectations from the audience. 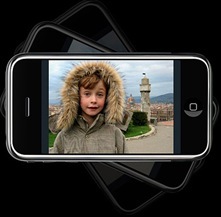 Mobile phone platforms feel suited best to short form video of 10, 15 or 30 seconds. Yes, people will accept longer videos, but only if the videos are chosen by the viewer through a venue such as YouTube or some similar site on which the viewer knows longer forms reside. My daughter downloaded the movie Boltto her iPod and she has watched it several times. But she chose that long form to put on her portable device. iPods and the iPod Touch are platforms where people can play entire movies, so a longer video is acceptable. We are experimenting with video on portable devices. Circle of Seven Productions (COS) offers video on mobile devices such as smart phones and iPhones and any other mobile phone device that allows for video. In addition we have video on the iPod, iPod Touch, PSP and even the Wii. Again the feel of watching a video on each of those platforms can vary. Watching the videos play on the large movie theater screen as though they were real movie trailers was thrilling. Even more thrilling was observing the audience around me as they watched them. The videos that appealed most to this audience were those that were acted out. True “book trailers.” Priest of Blood, Lady of Serpents and One With the Shadowscaused quite a stir among the viewers. This particular crowd was there to watch independent films at a festival. The trailers were part of the festival, so there was a lot of audience chatter after each video played. The quality was incredible and so were the CGI effects. But that was expected on the big screen. Online video play has evolved and viewers have their own expectations, but again venues matter. YouTube videos can play up to 2 minutes without a general audience complaining about the length; as long as it is entertaining. MySpace is a little more tolerant of long form video as well, but Facebook is faster paced and the preference seems to go to shorter video. Also, venues that are specific to readers want shorter videos unless the book is written by a celebrity author. The bigger the author’s name, the longer their video can be. 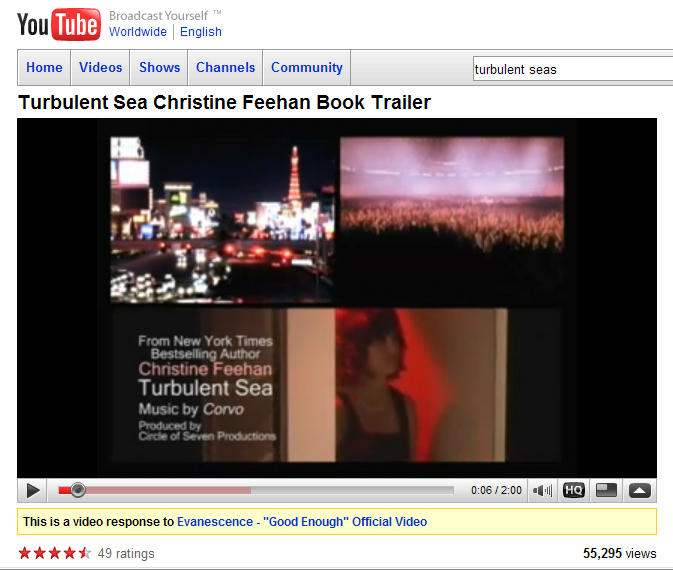 Christine Feehan’s video for Turbulent Sea, which runs 2 minutes and has tens of thousands of views across the internet is an example of this. According to the analytics provided by YouTube the viewers watched the video all the way to the end. If the video goes up as an ad it should be created as 10, 15 or 30 second spots according to the platform. For social media that is not specifically a reader site, 90 seconds is ideal. People on social sites want to feel that you are entertaining them, not advertising to them, so you have to be creative and you have to give them a little more for their time and attention. We have taken a single video and cut it into several lengths for different platforms. One book trailer was cut into a 15 second then a 30 second video for online and television advertising, then a one minute spot for reader sites and a 2 minute spot for social sites. It seems like a lot of extra steps, but being more thoughtful of the delivery of your video and how the receiver/viewer reacts or interacts with the video can mean the difference between a sale or no-sale, entertained or annoyed. Technology is ever-evolving and the end user continues to evolve in their expectations as well. Video is still hot, but it needs to be delivered to the venue and in the form most appropriate for the intended audience. Book Trailer – The New Book Cover? This entry was posted in book marketing, Book videos, Columns, open publishing, readership strategies and tagged book trailer, book trailer in theater, book video, iPhone, iPod, PSP, smart phone, Wii. Bookmark the permalink.